The four bedroom detached Oxford makes a strong first impression as a substantial, traditional family home, with bay windows, covered porch and classically styled front and garage doors. Even so, you'll still be impressed by the proportions of the interior, with ample space for everyone, both upstairs and down. 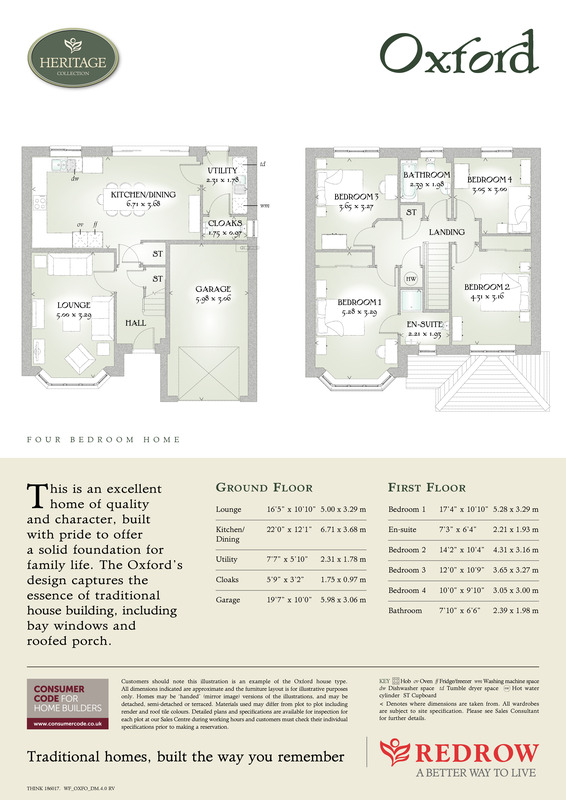 Upstairs features three double bedrooms and a generous single, with an en-suite to the master bedroom. You'll also find plenty of built in storage off the central landing, as well as family bathroom. Downstairs, the integral garage takes nothing away from the space on offer, with a large separate lounge and a spacious open plan kitchen / diner stretching across the back of the house. Every detail has been carefully considered here, from the designer fitted kitchen to the quality of the integrated appliances, with a wall of glass letting the light flood in through the double width patio doors. There's even space for a utility room and downstairs cloaks plus, once again, plenty of built in storage to keep your home clutter free. Square, solid and substantial, the Oxford is as impressive to live in as it is to look at. 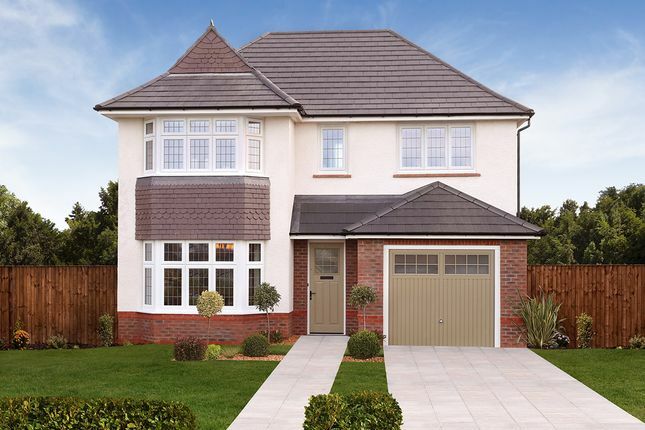 Offering a range of exceptional 2,3 and 4 bedroom family homes near Cardiff, within reach of excellent local transport links and good schools, Cae St Fagans is an ideal location to set up home and raise a family, knowing that as they grow, so will the facilities and amenities around you. Remember, you can move in for as little as 5% deposit with Help to Buy, and with our Help to Sell scheme available on selected properties, we could even help you sell your old home too. The local village of Pentrebane has a small selection of shops for your day to day needs, with an Asda supermarket to be found at Coryton and Tesco at Western Avenue, both just a short drive away. As you would expect from the Welsh capital, Cardiff has a whole host of culinary treats awaiting the hungry diner. But you don’t have to venture into the city to enjoy great food, with a choice of good quality gastro pubs and local restaurants right on your doorstep. Try the authentic Italian flavours of Cicchetti in Radyr or the Pickled Radish in Llandaff, or the traditional British menu at The Old Post Office. You’ll also find a friendly welcome at your local pub restaurants, including The Plymouth Arms, offering a great value menu of family favourites. As Plasdŵr grows, it will have its own dedicated schools, including several different primary schools to choose from. Meanwhile, residents of Cae St Fagans have a good selection of schools within easy reach, including the local Holy Family rc Primary, the Estyn ‘good’ rated Pentrebane Primary School and Ysgol Gymraeg Coed Y Gof. Older pupils can choose between the Estyn ‘good’ rated Bishop of LLandaff Church in Wales High School, Ysgol Gyfun Gymraeg Plasmawr or Cantonian High School, with the excellent rated Howell’s School for Girls and the famous Cardiff Cathedral School offering an independent alternative. Nearby Fairwater Leisure Centre has a good selection of sports facilities including swimming pools, while golfers can enjoy a challenging round at Radyr Golf Club. For sports spectators, Cardiff offers the very best in international fixtures, with the Millennium Stadium hosting Wales’ home rugby and football matches and Sophia Park home to England cricket games. There’s also a great selection of local cricket, rugby and football to be had in and around the city. For a more cultural day out, Cardiff is home to a stunning range of theatres and cinemas, offering shows, concerts and blockbuster movies for all tastes. Take a stroll around the delightful bars and restaurants of Cardiff Bay for a sophisticated vibe, or try the more traditional seaside feel of nearby Barry Island for some fairground fun. Whatever you are shopping for, whatever your budget, Cardiff will not disappoint. With over 1.4million sq ft of shopping, divided between modern malls and historic arcades, you can shop until you drop in whatever style that suits you. From major high street names and big brand shopping, to fascinating individual, independent stores, there really is something for everyone. If you prefer to avoid the city centre, try out of town shopping at Culverhouse Cross or Leckwith retail parks, or take a window shopping stroll through the boutiques of the Bay. Sustainable transport is at the heart of the plans for Plasdŵr, with Redrow investing significantly in road improvements and extra buses from the Garden City into Cardiff City Centre. The development plan also includes extensive cycleways and footpaths connecting residents to local schools, shops and leisure facilities. Cae St Fagans enjoys excellent rail connections too, with trains from nearby Fairwater Station, just a mile away, connecting to Cardiff Central in just 10 minutes. By road, Cardiff is just four miles away, with the M4 junction 33 even closer, connecting to Swansea, 35miles to the west and Newport, 16miles to the east. Merthyr Tydfil, gateway to the glorious Brecon Beacons is just 22miles to the north. Property descriptions and related information displayed on this page, with the exclusion of Running Costs data, are marketing materials provided by Redrow - Cae St Fagans at Plasdwr, and do not constitute property particulars. Please contact Redrow - Cae St Fagans at Plasdwr for full details and further information. The Running Costs data displayed on this page are provided by SmartNewHomes to give an indication of potential running costs based on various data sources. SmartNewHomes does not warrant or accept any responsibility for the accuracy or completeness of the property descriptions, related information or Running Costs data provided here.